THANKSGIVING IS the quintessential American holiday. Nearly four centuries have passed since that first celebration in 1621, when, as Edward Winslow wrote in a letter to a friend back in England, the settlers of Plymouth Colony paused to "rejoice together after we had gathered the fruit of our labors" and "for three days … entertained and feasted" with 90 of their Wampanoag neighbors. What Thanksgiving was at the outset — part joyful harvest festival, part expression of prayerful gratitude, part occasion for games and reunions — it remains recognizably to this day. 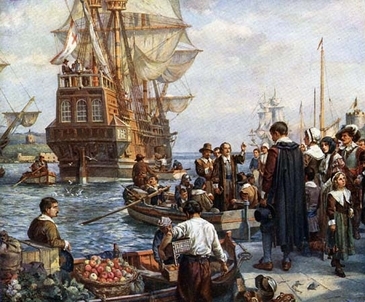 The Pilgrims board the Mayflower to sail to the New World. As they parted from their friends, "what sighs and sobs and prayers did sound amongst them." The story of that first Thanksgiving is also a story of immigrants, whose journey to the New World prefigured tens of millions of immigrant stories that followed. There is irony in the fact that Thanksgiving today is so bound up with "going home," as the crowded highways and packed airports of the long holiday weekend attest. For the Pilgrims "going home" wasn't an option. When they left Europe the year before, they left for good. As they parted from friends and familiar surroundings, recalled Plymouth's governor William Bradford, "what sighs and sobs and prayers did sound amongst them; what tears did gush from every eye." Well into the 19th century, most immigrants to America knew there would be no turning back. Before telephones, air travel, and the internet revolutionized modern society, immigration typically meant not only transplanting yourself to a new home, but severing your links with the old. Once that boat to America sailed, you left behind people and places and connections you had known your whole life, yet would likely never see again. The United States, we glibly tell ourselves, is a nation of immigrants, who have transformed America in the process of becoming American. Tens of millions of us have foreign-born loved ones, colleagues, neighbors, teachers. I grew up in Cleveland, where it was common to hear English spoken with Eastern European accents. Cleveland once had the world's second-largest Hungarian population and more Slovaks than any city on earth. I'm sure it never occurred to me how astonishing this was. If you're a US native, it's so easy to take it for granted that waves of people from other lands uproot themselves to come here. Yet try to imagine the opposite: throngs of US citizens forsaking life in America in order to start anew in Hungary or Slovakia (or Ireland or Vietnam or Nigeria). Try to imagine yourself among them, undergoing such dislocation. 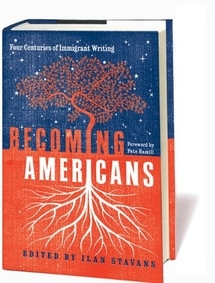 Recently I have been reading Becoming Americans, a sweeping collection of immigrant writing that conveys the experience of coming to America through the firsthand accounts of immigrants reaching back to 1623. Published by the Library of America, the anthology was edited by Amherst College professor Ilan Stavans, a Mexican Jew of Polish-Ukrainian ancestry who immigrated to America in 1985. He describes the book as his "love letter to the United States," but as many of the selections make clear, becoming Americans could be a wrenching ordeal. "The ship is full of pitiful signs of distress," he wrote. "Many people whimper, sigh, and cry out pitifully for home." Sickness and accidents took a terrible toll, especially among young children. "Parents must often watch their offspring suffer miserably, die, and be thrown into the ocean, from want, hunger, thirst, and the like." When the ship finally makes landfall, Mittelberger recounts, "people cry for joy, pray, and sing praises and thanks to God." Yet for many, worse was to come: Those without the cash to pay for their passage were sold into indentured servitude. Writing a century and a half later, the Norwegian-born novelist O. E. Rolvaag expressed the ambivalence so many immigrants felt as they tried to weigh the gains of becoming American against the losses of leaving their homeland. Rolvaag's gains included prosperity, enterprise, freedom, personal growth, and limitless opportunity. But against that was the "irreparably cruel" price of exile. The loss of a beloved fatherland was "a wound that can never be healed in this life," he wrote. "Even in the midst of happiness, it may come forth and cast its darkness over everything." On Thanksgiving, all Americans have reason to be grateful, none more so than those of us who were born here, and for whom the ache and rigor of exile was never the price of sharing in America's extraordinary blessings, as it was for countless millions of others.